Yesterday, I posted about the different types of text features that students will explore under standard 5. Today, I want to share a lesson that I like to do when digging a bit deeper into text structures with elementary school students. I hope it is useful! As always, I have included the anchor chart that we made with this lesson. If you use this with your class, let me know how it goes and share your experiences! Select examples of informational text that match each of the different structures you introduced earlier. Note: fourth and fifth grade will focus on the organizational structures. Third grade will focus on physical structures. I find that it is easiest to pull these from online news sources or photocopy a page from an anthology that shows the structure. Another quick and accurate source is a science or social studies book. These texts are rich with graphics and multiple entry points for the reader. It is easy to do a visual scan and select an excerpt that is organized in multiple ways. For this lesson it is not important just yet that students identify different organizational structures within a larger text. You are still helping them to conceptualize the structures, so a small excerpt is appropriate. Read each of your selected text excerpts aloud with the students. 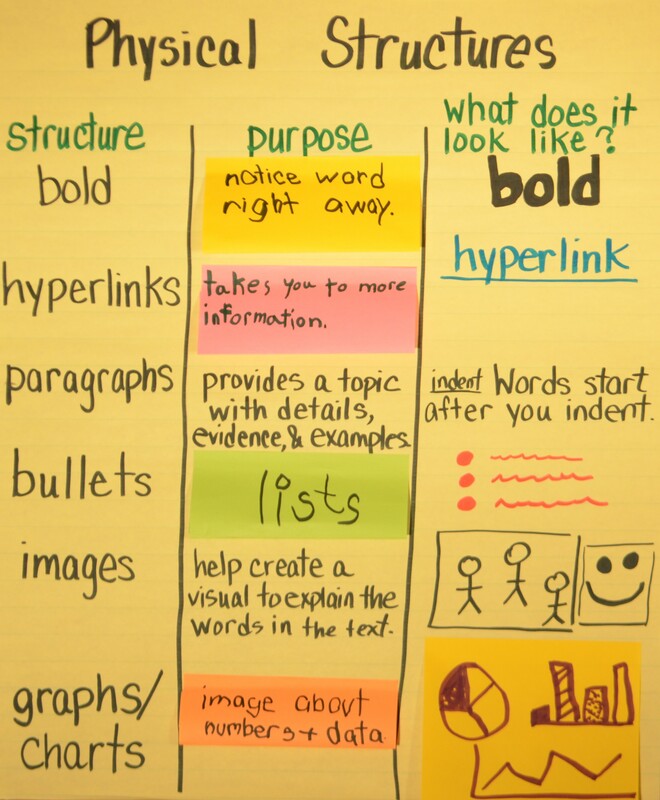 After you read each one, discuss what types of structure you noted. What function did it serve? How does it work? Ask students to engage with you as you try to encourage a discussion about each excerpt. Make sure that you classify each of the excerpts to the corresponding text structure and function. Using the initial anchor chart, add the signal words as well, or create individual signal word charts that show words to look for. 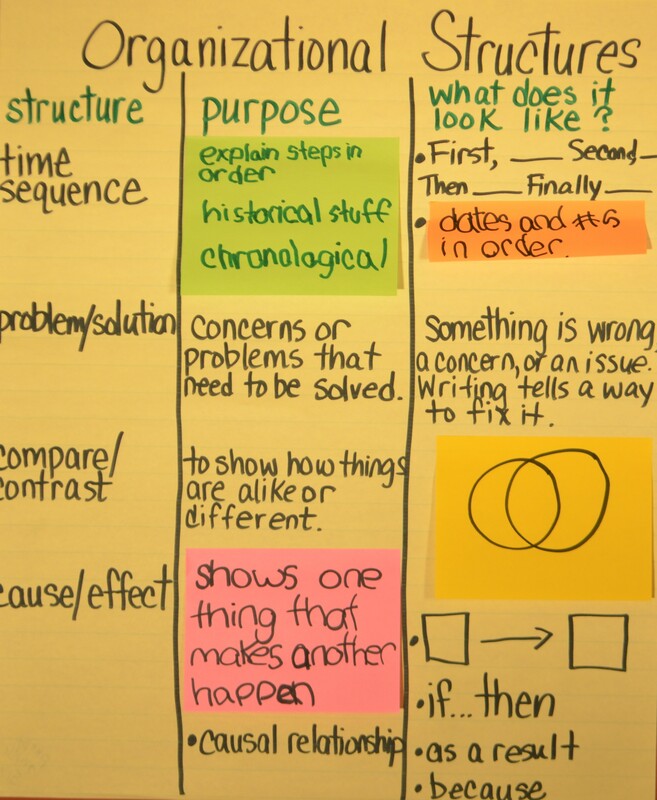 Students should create their own charts as you introduce and model each feature. This can be ongoing throughout the year or taught as a longer unit that introduces each structure.